31 May 2018 Noémie Goudal’s photographs are full of unsettled contradiction. The product of constructions, they lie between truth and fiction, the ancient and the new, managing to be both unified and fragmented, existing in a state of instability. This is immediately evident in her series Soulévement and is where the first work you encounter in her latest exhibition at Edel Assanti, Telluris, is from. Against a clear sky, in an empty landscape, a broken boulder appears to float above the earth. The image is fragmented and difficult to reconcile as the boulder has been divided by a scattered grid. While it appears whole, it’s isn’t; none of the edges line up, casting multiple shadows. Closer inspection reveals it to be the result of a deliberate staging; layers of carefully angled mirrors have been placed within the landscape, to reflect the rocky landscape beyond the composition. In transforming and configuring the landscape in this way, Goudal reveals the constant state of flux the geology of the earth is in. Landscapes from the past and the future are both revealed, in the stark black and white of the photograph, as the boulder comes together and falls apart. Discovering this ignites a sense of exploration. The entirety of the first floor is taken up by a trellis of open wooden cubes on which the photographs are installed at various points, and to discover them all, you have to traverse its passages. Opening out towards the back of the space, they lead you to the second series of photographs in the show. 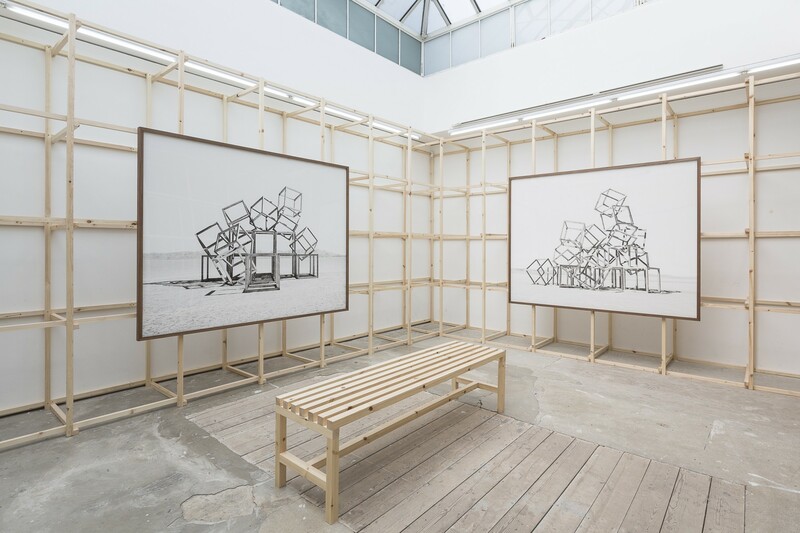 Three photographs, again, showing constructions in an otherwise empty landscape, depict piled cube frames, each made up of 25 cubes, coming together to form artificial mountains. They mirror the cubed construction around you and reflect the state of flux seen in the previous series. With some of the cubes balanced precariously on their edges, there is a certain fragility to their construction. Drawing energy from the construction housing them, they have a greater message. In places, the hollows of the cubes become like sightlines, lining up to frame the mountains on the horizon line. Go forth, they seem to suggest, there’s more is waiting to be discovered. Downstairs, Goudal’s investigation into construction and reality takes on a different form and sees her exploring the use of a stereoscope as a way to present photography. In the centre of the darkened room, two slide projectors project a photograph of a rocky, forested landscape onto two screens. Between them, an angled, mirrored post reflects the images. Standing just so, the reflected images take on the illusion of being three dimensional. For all its effectiveness, it’s impossible to ignore the apparatus that surrounds it, the slide projector clicking noisily. However, the slides are digital emulations of this effect and when facing the mirror, it is realised that each slide presents different features of the landscape. Even as Goudal brings reality into the room, she undermines it, always reminding the viewer of the fiction that she underpins the works with. Goudal’s work deals with natural human questions, connections and impulses. They brim with the drive to understand our place in the landscape, knowledge of the inconceivably long lens of the universe, and the distance between what we can see and understand.